I’m still catching up on 2013 reviews, but 2014 reading is well underway. Here’s what you can expect this year on Reading in Bed. 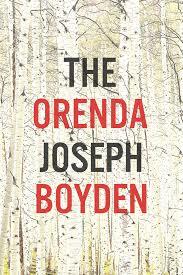 The Orenda by Joseph Boyden. It’s my current read and HOLY CRAP IS IT GOOD. The Bridge of the Beyond by Simone Schwarz-Bart. nybooks.com says: “This is an intoxicating tale of love and wonder, mothers and daughters, spiritual values and the grim legacy of slavery on the French Antillean island of Guadeloupe.” Yeah. Plus, that cover. 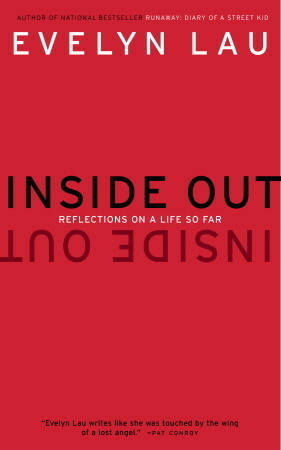 Inside Out: Reflections on a Life So Far by Evelyn Lau. An excuse to write about how Lau’s first memoir, Runaway, changed my life. 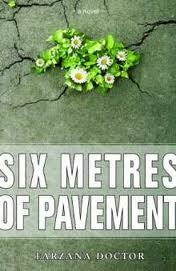 Six Metres of Pavement by Farzana Doctor. My favourite calendar girl in Bare it for Books. Follow book blogger Leonicka for lots of resources on diversity in Canadian literature. She’s going all out and reading 85% authors of colour this year! My next local read will likely be Come Barbarians by Todd Babiak. As for new #yegwrites stuff, so far I’m looking forward to Marina Endicott‘s fourth novel, Falling for Hugh and Laurence Miall‘s debut novel Blind Spot. 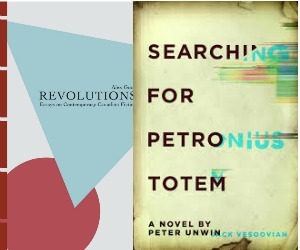 Here’s a great roundup of Edmonton books in 2014. 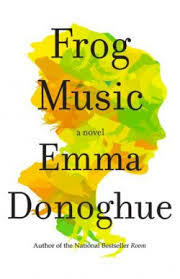 Frog Music by Emma Donoghue. She’s got a way with titles. I loved Room and Slammerkin, so my expectations are high. 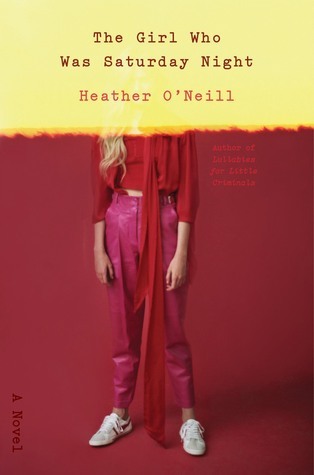 The Girl Who Was Saturday Night by Heather O’Neill. I’ve been waiting eight years for O’Neill to write another book. Bring it on! 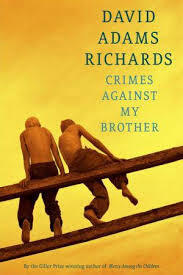 Crime Against My Brother by David Adams Richards. Apparently brings the main character of Mercy Among the Children back – one of my favourite books of all time. 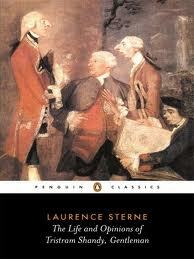 I will also solider on with the Storytellers Book Club challenge. It helps that I won a set of all five books in their contest last year! I haven’t forgotten about The Classics Club! In fact, I’m right on pace. I chose 50 books to read over five years, and approaching the one year mark, I’ve read eleven. I’m also contemplating Behold the Star’s Russian Literature Challenge. Krisitlyn of Reading in Winter gave me War and Peace for Christmas, plus I hear reading Chekhov can improve your life. The English Patient by Michael Ondaatje: Too young. Attempted at 22 or so and got really lost. 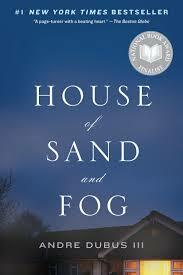 The House of Sand and Fog by Andre Dubuois III: Too young. Read at age 20. 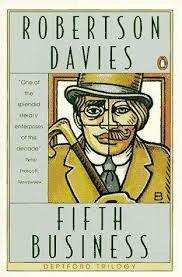 Fifth Business by Robertson Davies: Too young. Forced to read in high school, I hated it. Read a description of it recently and it sounds AMAZING. This sounds like a lot of books, but I’m leaving room for random books, recommendations, read-alongs, and review books; you know, the four Rs. Obligatory end-of-post question: what are YOU planning to read this year? I love the cover and the title of The Girl Who Was Saturday Night. This is really inspiring me to make some reading commitments myself instead of just buying books and letting them pile up (in digital and physical form)! Time to sort that bookshelf! I’m not even considering them commitments (because, yeah, that pile…) just… considerations. I’m sure most years I read more male than female written books, but last year I just decided to try and read more female authors, with no set goal, and read 66%. I’m happy to hear you’re loving The Orenda. I can’t wait to hear what you have to say about it! I’m not great at looking too far ahead with my reading, but generally I’m planning to continue with lots of CanLit. I’m hoping to finally read both Room and Lullabies For Little Criminals, so I can get to Frog Music and The Girl Who was Saturday Night. And Fifth Business has come up many times as a book I should read. Thanks for the link to Leonicka’s blog! I’m flying through The Orenda right now, read 100 pgs over the weekend. Room and Lullabies are so good. I just got the US publisher to send me an advance copy of The Orenda — I can’t wait! I had the opposite experience with Fifth Business in high school — I read it and fell in love. 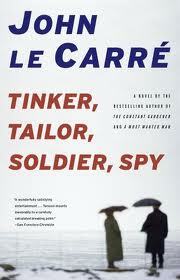 That class was pretty much a dud, reading-wise, except for Fifth Business and one other book. Pretty sure it was the first bit of CanLit I ever read, actually. I ended up writing about it (and about 12 other books — my advisors must have hated me) for my undergrad thesis. Oo lucky you! Have to say I prefer the Canadian cover. It’s so exciting when we have something first, heh. Yeah I really must revisit. I must have been extra sullen that semester or something, probably wouldn’t have liked anything. Come Barbarians is definitely on my list for this year! I’m trying to go kind of in order of when I received them … I’m not sure where it falls on the list! On my spreadsheet I didn’t note if the author is of colour, but I am trying to venture outside of the U.S. since a LOT of authors I read are from there … though, when I’m trying to tackle only the books I own (well, mostly) it’s tough to have diversity in that area. We shall see. I think 5Th Business may be the book that made me a life long reader. Enjoy! Really? Tell me more! Did you read it in high school too? Late to the party, as usual, but Fifth Business also changed my world (I read absolutely everything by Davies after that). And I think you should totally create a challenge! Having started to read If on a Winter’s Night a Traveler after having meant to finish it for eons, I’d like to do that with many more of my DNFs! I can’t wait to read Frog Music either! The Good Mother Myth edited by Avital Norman Nathman: Review + Giveaway!